Its true Cubans tend to be noisy, romp with aplomb, and sow their oats with gusto and few regrets. They are also big talkers – waxing eloquent on topics about which they’re clueless or avoiding silence at all costs; I know a lot of women here, for instance, who never, and I mean ever, shut their mouths, talking about whatever minor thought skips across their brains (I always send a silent shot of strength to the spouse when I meet a woman like this). Then there’s the Cuban classic, which I call ‘blah, blah, blah’: giving a long, considered response – to an entirely different question than the one asked. Actions belying words also falls into this “classic” category. These are all generalizations of course – but that doesn’t obviate their veracity. Indeed, stereotypes exist because they apply to huge swaths of a population. And if you know Cubans, you know that these generalizations are true for many or even most. Which is why I’ve become fascinated with stereotype-defying folks here. 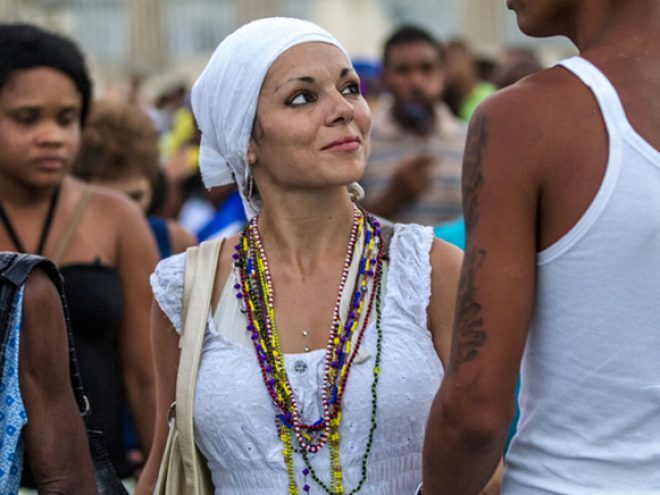 People who break the mold anywhere have always intrigued me, but Cuba has traditionally emphasized unity over individuality, is small and (relatively) isolated, meaning there are fewer mold-breakers. These are what I call, for lack of a better term, ‘not-very-Cuban’ Cubans. Each one was born and raised here, lives on the island still, went to all the same schools, political rallies and lame concerts (Air Supply, ahem) as the rest, but exhibit few typically Cuban traits. Sure, they’re missing teeth, can be unreliable, and are prone to slack; in the end, they’re a product of their context and yet…not. I’ve met a couple of their kind over the years, but recently I’ve come to know several fairly well – they intrigue and puzzle me in equal measure. For instance, not one of them has been off-island and each works for the state (as well as ‘por la izquierda’ because that’s how survival rolls here). Age might be a factor – the folks I write about are between 25 and 40 – but I’ll have to think more on that since I don’t have the analytical energy just now. By chance (or not), each person described below is also male, but again, my analytical reserves fail me. What I’m coming to realize as I write this is that place – la siempre fidelíssima Isla de Cuba – has much to do with their character (each is proud to be Cuban), but little to do with their mold breaking: these people would be, and will be, who they are, no matter where they are. I’m not sure I’ve met a Cuban as callado as this guy in the nearly dozen years I’ve lived here. He’s so quiet he makes me nervous. Have I insulted him? Is he bored? Does he simply have nothing to say? This last I discount not only because he has that ‘still waters run deep’ thing going on, but also because when he’s on stage playing his cutting-edge compositions, he speaks volumes. When I asked a mutual friend: ‘what gives with Daniel? I’ve known my share of strong, silent types, but he kind of takes it to the extreme, doesn’t he?’ She laughed. ‘Yeah, I’ve known him my whole life and I’d swear he was born in Europe instead of La Ceiba.’ Quiet, measured, urbane, and bling-free: he actually reminds me of some New Yorkers I know, this ‘not very Cuban’ Cuban. One of Cuba’s new frontiers is being mapped out by pews and altars, chapels and collection plates (big, deep ones). As an agnostic skeptical of all organized religion and someone who has seen both the good and bad wrought by evangelical churches throughout Latin America, I have to say all the conversion going on around here has me concerned. The phenomenon is replicating itself from Sandino to Baracoa, with record numbers of converts packing pews most nights and some days too, as they attend bible study, Sunday school and other church-y activities (see note 1). The people I know in Havana who have been sucked in belong to these churches are usually either not too bright or dealing with some social issue – alcoholism or delinquency, for instance. But not my ‘not very Cuban’ Cuban friend, who breaks even this mold: he’s smart, has a good job, a wife, his own transport, a nice place to live and two happy, well-adjusted children. Furthermore, he was always more of a rebel than a joiner, rejecting the mob mentality. Flash forward to any recent Sunday, however and he’s wholly subsumed by one of these churches – to the tune of several times a week for 8 hours at a clip. And the proselytizing has begun, with non-responders feeling the freeze-out. Hyper observant and curious, this ‘not very Cuban’ Cuban takes people to task for littering and ‘envidia’ (see note 2), has lovely manners, smells naturally great in the heart of summer (see note 3), and pardons himself when he (infrequently) interrupts. He’s also vehemently anti-gossip and comfortable being alone – criteria enough to make him a peculiar Cuban. Surely this aversion to the maddening crowd is the gamer in him – he admits to shutting himself in for 8 hours or more when he’s mastering a new game – but I thought everyone here was hard-wired for social gad flying. To an extent, anyway. This guy, however, would hole up on a mountaintop with just the bare necessities given the chance, which sounds extreme even to me, a solitary mountain girl at heart. In another inversion of a Cuban stereotype, he’s not afraid to ask questions, learn about what he doesn’t know, and pursue new experiences – including hard work. He’s got a hunger for knowledge and the confidence to seek it out I don’t see that often in Cuba’s 20-somethings. It’s refreshing and hopeful, especially because it comes from the next generation, too much of which has lost hope here. 1. Let me emphasize that I’m referring to anti-scientific, charismatic churches (what’s sometimes referred to as neo-charismatic or neo-Pentecostal), not the traditional kind where you go on Sunday to pray and catch up with the congregation. The kind that freak me out are the ones where the pastor fairly preys on his flock, encouraging adoration of him and distance from non-believing friends and family.